Over the years we have become used to grabbing a phone, “dialling” a number and start talking. It’s a simple algorithm – every phone user is familiar with it. Over the past couple of decades supplementary services such as voice mail, call forwarding and call waiting have become all too common. More recently, if you walk down the phone aisle of North American retailers selling cordless phones, you’ll see the term DECT 6.0 prominent on the phone packaging and promotional collateral. So how can one “just add Skype” calling to this most familiar consumer calling experience? Over the past three years several Skype partners offered cordless phone hardware that met this criteria. One of the veteran vendors has been RTX with their various USB phones and cordless Dualphone offerings. 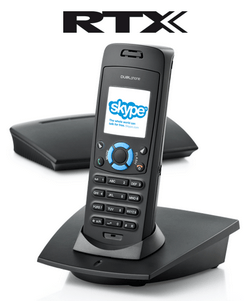 Recently RTX approached In Store Solutions as a recommended distribution channel; they concluded an agreement for worldwide distribution of their 3088 Dualphone via the In Store Shop on the Skype Store. However, expanding sales into North America required adaption of the DualPhone to not only a North American approved power plug but also the North American rf channels available for DECT, known by the term DECT 6.0, which provides the audio connection between the base station and handsets on the majority of cordless phone packages sold today. A cordless handset, with a belt clip, connected to the base station using the crystal clear, interference-free DECT 6.0 standard for cordless home phones. Charging cradle, along with AAA rechargeable batteries. Use a separate Skype account from any account you may be using for, say, business or personal privacy reasons. You don’t want the rest of your family or roommates answering your private business or personal calls. SkypeOut availability takes advantage of Skype’s low cost rates or calling plan subscriptions to almost every country worldwide. It’s also smart enough for dealing with the North American area codes where one may or may not need the “1” to place a call within or across area codes (Toronto region’s four area codes with two overlays, yet varying local calling reach, is an ideal example of this). Have four handsets in various locations around the house without worrying about wall jacks to the wiring is definitely a benefit. With its own embedded “computer”, its operation over Skype is totally independent of call disruption from other programs running on a PC, such as Outlook. The base station’s portability has been a useful feature when diagnosing problems with my Rogers Home Phone cable modem (different from the Internet cable modem) and its one wired connection required to a central location in the house. Service can continue by placing the base station at the modem site while problems are diagnosed and the wiring is repaired. It eliminated the need to repair the home phone wiring setup (beyond the base station connection) when lightning went through some devices in my home last summer. The RTX Dualphone for North America is available via the In Store Solutions Shop on the U.S. Skype store (with introductory promotional pricing of US$149.99 until December 14). It will be available soon on the Canadian Skype Store. Bottom line: if you’re looking for a way to have you entire household on both your local PSTN service and Skype through a single handset, the RTX Dualphone provides a user friendly, easy-to-install solution. From up to four locations within your house or apartment, it supports both local PSTN and worldwide Skype calling at a very low overall cost. Review: The Luxury Cordless DualPhone (Dualphone 3088) For Skype Voice Internet Calls!